An exquisite eco friendly place surrounded by the stretches of undulating span of tea estates and wildlife with the panoramic grandeur of the Himalayas in the background, wrapped in the lush embrace of a tropical rainforest, you will be in perfect harmony with nature, pristine and waiting to be explored. Allow yourself to be seduced by the orchestration of delicate, subtle sounds accompanying nature's theatre. Quietly elegant and exclusive, the Resort is a state of mind with breathtaking vistas Wish to escape the hectic city life and enjoy nature at its best? Rush to the forest glades of Lataguri, a place of divine beauty that will mesmerize your senses. lying pretty in the lap of nature and surrounded by lush greenery, Unique Inn is a luxurious resort with all modern amenities. 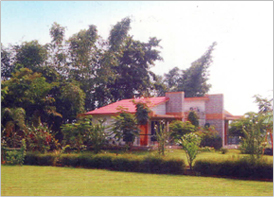 The resort spreads out over 3 acre of land with beautiful cottages set amidst landscape greenery. Every handsomely decorated cottage gets the close touch of nature. Each double-bedded room have a attached bathroom and a private balcony with magnificent views. An open and spacious dining hall with modern kitchen, serving vegetarian and non-vegetarian cuisines adds to the beauty of the resort. Days begin with the rousing melody of whistling thrush. The forest comes alive with an orchestration of sounds and bands of foraging monkeys. The day ahead is ripe with possibilities. Guests may chose to relax in their cottages, go for a jungle safari in the company of naturalist, play indoor games or take part in the many outdoor activities that the resort has included in its itineraries..